As you know, an earthquake happened at 14:46, 11, March on Sanriku Coast. According to Japan Meteological Agency, the Magnitude was 8.8 (180 times as large as Hanshin earthquake). This figure was the biggest since the institution started to gauge tha size. This temblor was named "The 2011 off the Pacific coast of Tohoku Earthquake" (reference ). Up to now, many damages caused by this earthquake have been reported. 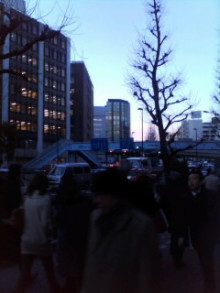 In Wakabayashi Ward, Sendai City, it was cofirmed that more than 300 people were killed by this disaster. The disaster area stretched across all of Eastern Japan, especially Aomori, Iwate, Miyagi and Hukushima Prefecture. At that time, I worked in my office in Tokyo. Feeling the tremble, my boss ordered us to hide beneath the desks. Hiding myself, I was afraid to be killed. Fortunately, we had only small damages in my office. After the incident, we escape from the office to a park near from it. 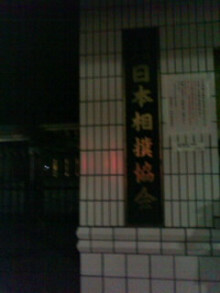 Many persons gathered there. We stayed for about one hour. All train services got stopped, therefore we could not use trains to come back homes. It was inevitable to chose staying at office or walking to homes or accommodations. Fortunately, I expect myself to take for about one hour to come back home on foot. Thus, I got out from the office after I confirmed the safety of my wife. On my walking, I found some scenes which I can not see in ordinaly lives. I recorded them with my cell phone. On the roads, many people intended to come back home inundated. Edo era, there was a bridge built by prestige porter (Benkei). 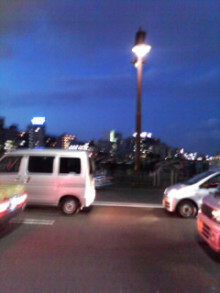 For the first time, I walk across Sumida river. 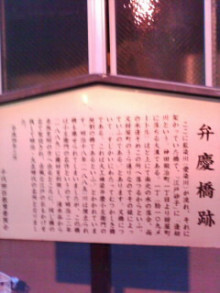 At Ryougoku, I found the plate of "Nihon Sumo Kyokai ". The association have also trembled for a while. 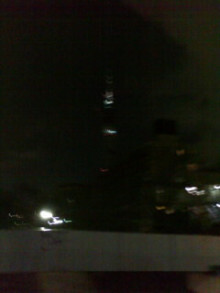 The light on the center shows "Tokyo Sky Tree ". Although it is under construction, it seems to incur no damage. I needed about one and half hour to arrive home. I was very exhausted. When I entered into the room, I could understand our damage immediately. It was in a mess and some dishes were broken. But, these damages were all. Through E-mail service, we can ensure the situation of parents of my wife and our friends in Sendai. No one was killed or injured as long as I know. On Twitter, many and wide range of informations were provided. I was very startled at the amount and quarity of them. At home, the way to contribute for victims is limited. So, I tried to send the informations through Twitter to my acquaintances and victims. For that matter, I found that a friend shared the informations on Facebook aggresively and I was moved the figure. I review the fact that earthquakes come when we forget the existence. It seems to be true. Althogh a large earthquale happened at New Zealand recently, I did not regard it as our future threat. Even though I experienced tremendous temblors in Hyougo and Sendai, I did not prepared for this situation. From every edges of the world, lots of massages were introduced for us. I am encouraged the fact. On Twitter, I saw a condlence from Barack Obama, the President of USA, and replyed to it. I thank Twitter for the service because I, a mere citizen, can express appreciation to the President of USA directly (of course, I do not know wether he checks the message). This earthquake must be a severe disaster for us. However this is also a good chance to strengthen our cord each other and to other nations. We Japanese have endured many disasters from ancient era and have reconstructed at every times. We can follow the histrical theory today. We will need much energy to recover from this consequence. Neverthless, I wii contribute for others as possible to believe positive future.